This week is the FGS Conference (Federation of Genealogical Societies Conference) and if you’re like me and are unable to conference but still want to learn, here are my favorite go-to sites for genealogy handouts. 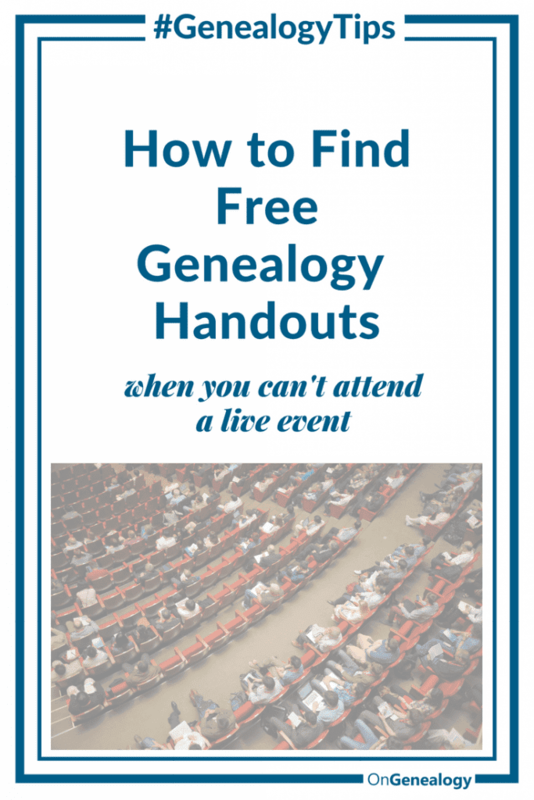 Most Genealogy conferences don’t allow unpaid visitors to view conference handouts, but RootsTech does. RootsTech is the largest genealogy convention in the world and has classes for all skill levels. Select the PDF icon for the class of your choice. A new window will open with that specific class’s description. At the bottom of this page is a Resources tab with Handouts. Select Handouts. If there’s more than one handout, select the specific handout you want to see. It will open in a PDF on your computer. You can download it to your computer or print it to your home printer. Do this process for any other handouts for that class. Do the entire process for any handouts you want from that RootsTech Conference. LegacyFamilyTree Webinars is a subscription site that also has some FREE webinars. This is one of the few subscription sites I pay for. I love the diversity of topics and the expertise of the presenters. When they offer a free webinar, they usually make it free to view and download the handout/syllabus for one week. BYU offers free weekly webinars and some include handouts. The Southern California Genealogical Society is a large, successful society which holds yearly conventions and regular webinars. Webinars are free to watch live, but archived webinars are only available for members of the society. They do offer a small sampling of archived webinars with handouts, linked below. FamilySearch is a completely free genealogy site sponsored by The Church of Jesus Christ of Latter-day Saints and they offer monthly webinars. You can view archived webinars or sign up for an upcoming webinar, both will often include handouts.